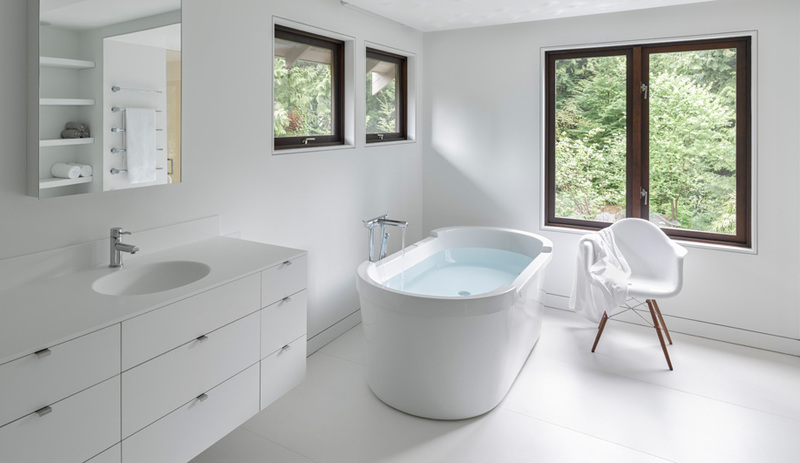 Gates-Suter Architects uses a soup ladle and white Corian surfacing to create acoustic control in the bathroom of a North Vancouver home. 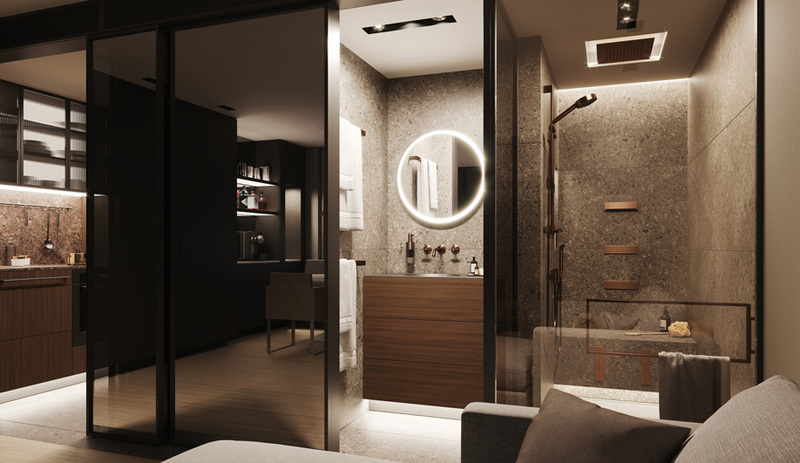 Engineered solid surfacing is a natural choice for a bathroom. 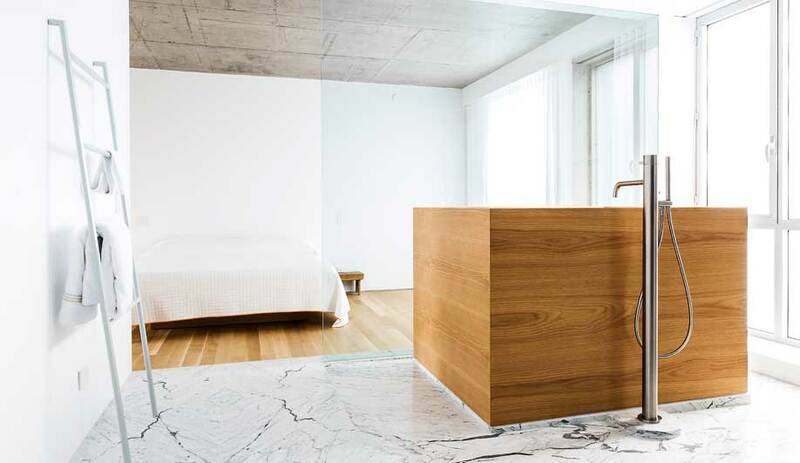 Its seamless, non-porous nature makes it ideal for forming countertops and even shower rooms. But rarely is it considered for its acoustic potential. A recent project by Vancouver’s Gates-Suter Architects proves it should be. 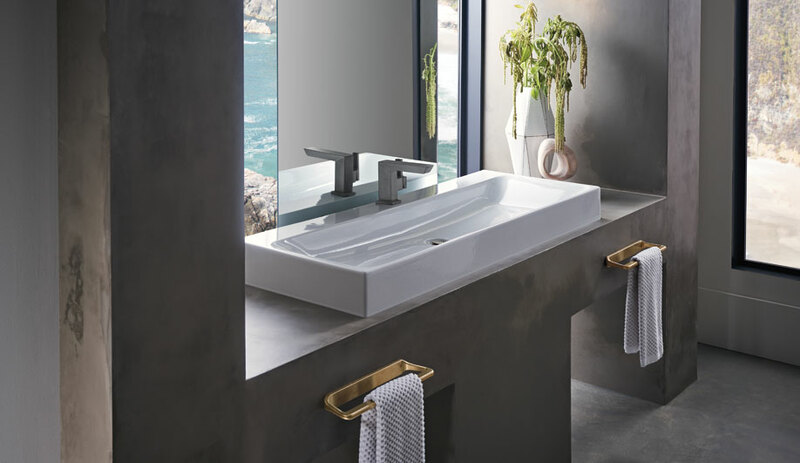 The architects were tasked with replacing a sea of tiny tiles and germ-catching grout lines with new, easy-to-clean surfaces in the master bath of a North Vancouver home. But the renovation equally prioritized another mandate: to reshape the acoustics. The room shares a wall with the bath and bedroom used by the clients’ teenage daughter, and any sound on either side transferred to the other. For visual cohesion, the circular motif was carried over to the accessories, sinks and Bocci electrical outlets alongside the mirrored cabinets. 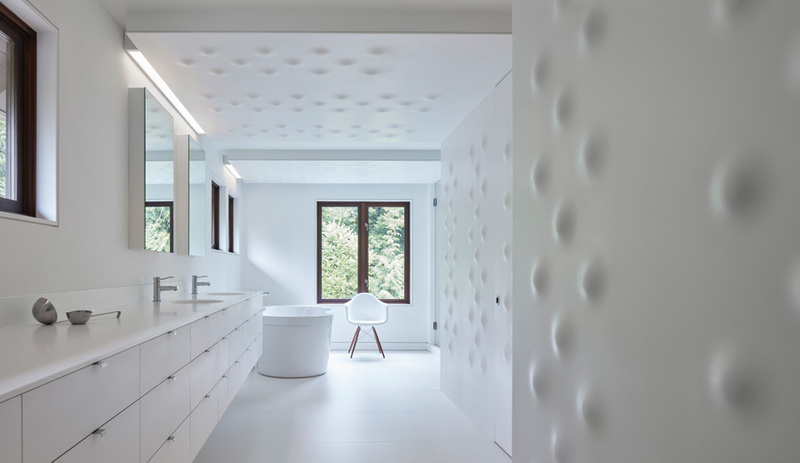 A round bump, moulded into the wall’s surface, was chosen for its ability to push sound in all directions. “We were looking for visual calmness, so it was important that the ‘bumps’ operate as a textural field,” explains Gates. After much deliberation on how to shape the staggered pattern, Paragon suggested a unique solution: metal soup ladles. “They were exactly the right size, roughly three inches’ in diameter. Paragon cut the handles off them and attached them to a plywood form.” Each of the 16 bespoke panels used on the walls and ceiling is identical, made with that same mould, the repetitiveness contributing to an overall tranquility. Paired with a mass vinyl barrier and a rock wool acoustic insulation back layer, the panels are not only acoustically effective, but offer an unexpected and changeable intrigue in what could have been a very stark white space: The existing large, wood-framed window affords a view to the house’s forested site, and the reflective nature of the white Corian, even as it pushes sound out, draws the greenery into the room. Custom cabinets are fitted with hardware by Cantu. 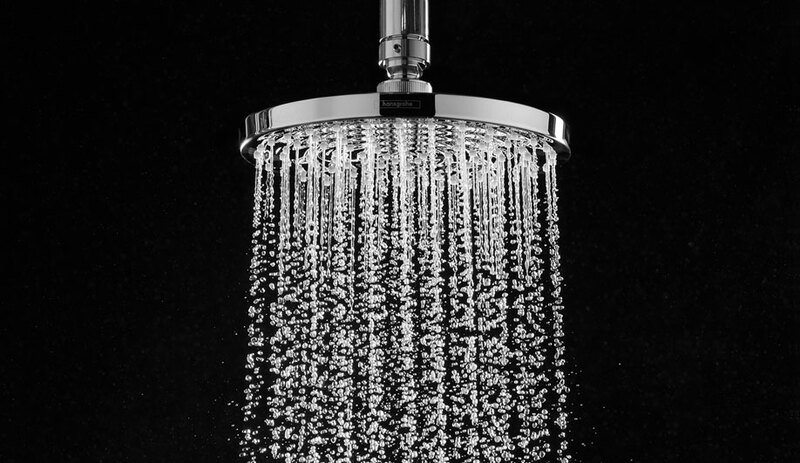 The faucets and freestanding tub are from Blu Bathworks. While the tub and faucets from the original space remain, new round Corian sinks are thermoformed into the ½-inch-thick countertop, evoking a “negative bump.” Round electrical outlets from Bocci further complement the textural pattern, and the toilet room is hidden behind one of the textured Corian panels, helping to maintain the sleek aesthetic.